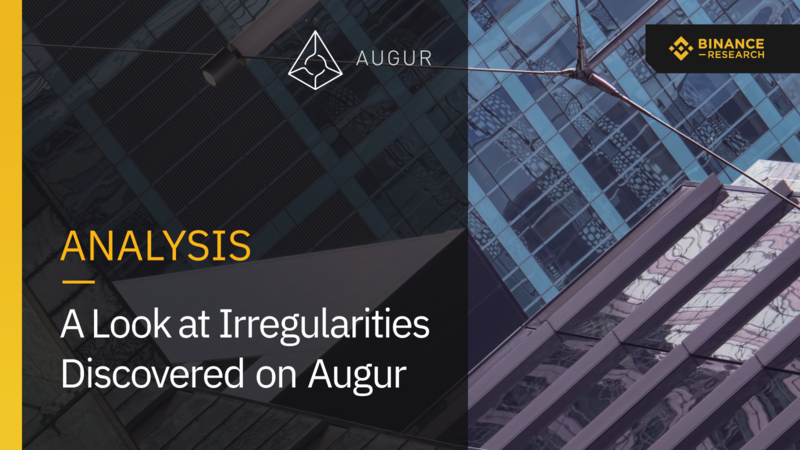 In a new report, Binance Research takes a look into irregularities discovered on Augur, a decentralized prediction market platform built on top of Ethereum. Binance's market analysis team, has released a report identifying irregularities and a "design flaw attack" in an actively traded prediction market expiring on April 1. "Though the project has stimulated some questions about the legality of some prediction markets and the actions that they may incentivize , the platform itself still has yet to be thoroughly investigated by many," Binance Research said about the prediction market platform. The report further reveals several issues faced by Augur in its current iteration, including low liquidity and participation rates, bare-bones usability functions, and complex voting, settlement, and forking mechanisms. "Augur’s steep learning curve often causes new users to utilize one of two websites - an IPFS-hosted version of a web interface, or the 'augur.casino' website," Binance Research noted. "On these websites, the UI offers several sorting and filtering mechanisms, either by volume, by ending date, or by open interest. This may lead to certain markets receiving more exposure than others via manipulation of its orderbook."